Recommended to: Readers who enjoy dystopian fiction featuring teen protagonists. I'll admit it, I requested this book simply because it was all about teens ruling a dystopian world. Sure, I've read stories similar to The Young World before. It still never stops me from wanting to read the next one. I love seeing how each new author tackles the important points of a society like this. How the authors perceive young people, and how they would behave if a catastrophic event like this actually happened. I was eager to see what Weitz would do, and I had high hopes for this book. First off, kudos go to Chris Weitz for explaining how the Sickness came about. Is it something that is likely to happen in real life? Probably not. Am I happy that I wasn't left wondering how on Earth only teens were left in the world? Yes, absolutely. If, as an author, you take the time to share with me where your whole story stems from, I'm happy to follow along. I'll suspend disbelief to enjoy the tale that you've woven. Just give me something to latch onto. Weitz did just that, and it made me one very happy reader. I was also fairly enamored with the society aspect in this story. The stark contrast between the small community that Jefferson and his brother set up, and the other bands of kids around them, was interesting. I liked that, depending on who was in charge, each group of teens had their own laws, their own caste systems, essentially whatever it was that tenuously held them together. It made for a read that raised a lot of questions, and I appreciated it. What I didn't like so much, as reflected by my rating, was the way that the narrative was done. Jefferson and Donna were our two main characters, and they couldn't be more different if they tried. Jefferson was quiet, intelligent, and mostly peaceful. Donna was rowdy, opinionated, and honestly kind of annoying at times. I didn't mind that story skipped back and forth between these two. I only wished that they didn't have such different ways of relaying their pieces of the story. It was disorienting, and frustrating. In fact, I wasn't a fan of most of the characters. They felt like cut-outs. Like people who were included in order to make sure the group was rounded out. You have your brainy/jack of all trades guy, your unassuming girl who is actually a ninja, the flamboyant guy for comedy relief, and then Jefferson and Donna to round it all out. I didn't dislike these characters. I just never connected with them. 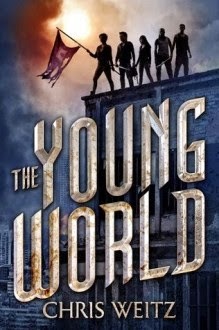 So three stars to The Young World for great world-building and for actually letting me in on the secret of the Sickness! I see a lot of people definitely enjoying this book. I say, give it a shot.